The Spain Room is a tribute to the two Sicilies and Bourbon dynasty that was able to impress in the mansions, the pomp and luxury that has marked an era. The furniture in accordance with the colors of the House, at the same time recalls that period of grandeur and elegance. 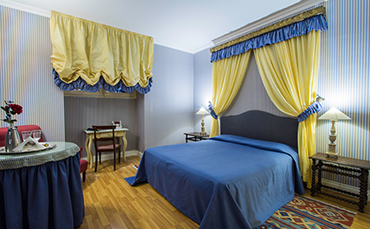 The room appears to be an intimate retreat for a romantic holiday.